Need for intelligent security systems, rise in terrorist threats, growing public and private infrastructure coupled with rising crime rate had propelled the demand for video surveillance systems in India. Advantages of surveillance systems over physical security such as ability to allow remote and continuous monitoring has resulted for the wide deployment across the country. According to 6Wresearch, India video surveillance analytics software market size is projected to grow at a CAGR of 32.7% during 2018-24. Traditionally controlled by analog based surveillance systems, India market is now shifting towards IP based surveillance systems. IP surveillance segment is registering positive growth in various vertical markets, predominantly across government & transportation, banking & financial, and commercial offices. With increase in deployment of IP based surveillance systems, rising demand for video surveillance analytics software market is witnessed in the country. Although, India video surveillance analytics software market is in developing stage, but the market is expected to register significant growth during the forecast period. In micro application, presently, Perimeter Intrusion Detection (PID) and Automated License Plate Recognition (ALPR) segments registered highest India video surveillance analytics software market share. However, during 2018-24, the face recognition micro application segment is likely to register significant CAGR attributed to expected deployment by the government for public safety. The India video surveillance analytics software market report thoroughly covers India Video Surveillance Analytics Software market by applications, deployment, verticals, and regions. 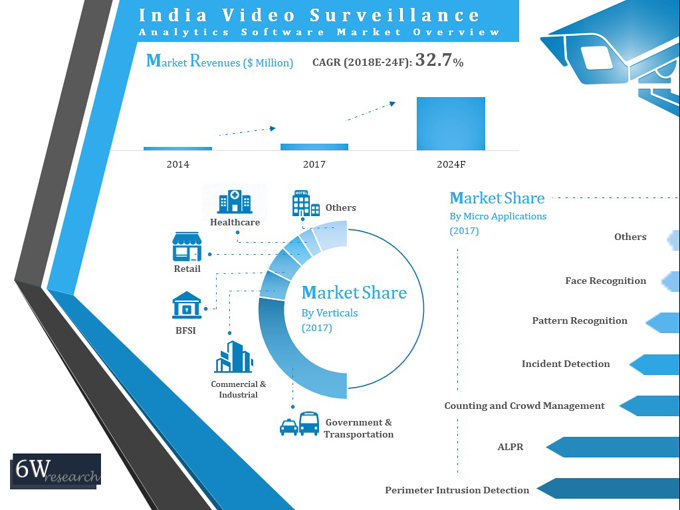 The India video surveillance analytics software market outlook report provides an unbiased and detailed analysis of the India video surveillance analytics software market trends, opportunities/ high growth areas and market drivers which would help the stakeholders to device and align their market strategies according to the current and future market dynamics. 7.1 India Video Surveillance Analytics Software Market Revenues, By On-Premises Vs.
12.1 Honeywell Automation India Ltd.
12.4 Cisco Systems (India) Pvt. Ltd.
12.5 Allgovision Technologies Pvt. Ltd.
12.6 Videonetics Technology Pvt. Ltd.
12.7 Agent Video Intelligence Ltd.